I walked back to my minivan with a donated suitcase in hand and tears in my eyes. A mom from my kids’ school volunteered to give me a suitcase we needed, but she also prayed over me. She wrapped her arms around here right there in the doorway on the front porch. Danielle only knew the basics of my upcoming mission trip: My oldest two kids were going with Greg and me to Guatemala. Yet she prayed specifically over things that had been on my mind. She prayed with confidence that comes with knowing God intimately. She considered the missionaries we are going to serve with, the people we would meet, my youngest who would be at home with grandmas, the supplies we were taking, the stories I’m surely going to write and tell when we get home, and the anxiety that can come with the leaving the familiar. I popped the trunk and loaded the suitcase that was exactly what we needed to carry our donations and then leave with the missionaries who could carry clothes to families in all the towns they serve. “Why did she hug you so long, Mom?” one kid asked. “Yeah, she hugged you a long time,” the other echoed. Honestly, Danielle’s prayer was exactly what I didn’t know I needed. Anxiety about leaving my youngest and general trip preparations had been creeping in. I want to go. I know we can help Bethel Ministries International missionaries with what they’ve been doing in Guatemala for decades. But I still was feeling all sorts of emotions. God showed up right there on an acquaintance’s porch. Yes, giving away a suitcase to support our mission was kind, but her prayer was sincere generosity that blessed me. a village to do anything worthwhile. We have sixteen large suitcases stuffed with clothes, toiletries, school supplies, shoes, blankets, and other goodies for the Guatemalan families we’re going to visit next week. That’s one suitcase for each person on our team. We represent at least four different churches, although most of us have been on previous mission trips to serve with Bethel Ministries International in Guatemala. Many of those suitcases were gifted and filled with other donations. People have donated money and supplies. People have prayed and encouraged. Yes, next week our team of 16 will be in Tecpan, Guatemala, but we aren’t going alone. This will be our second mission trip to Guatemala. Our trip in 2015 was life-changing and I brought home plenty of stories, some of which I’ve shared here. I wrote most of this post before knowing the devastation from the volcanic eruption in Guatemala on Sunday. Our team leaders and missionaries are still determining if and how much the aftermath of Volcan de Fuego’s major eruption will affect our trip, mostly getting from the airport to our destination. I look forward to sharing with y’all what God does on this trip. Until then, the #PorchStories linkup will be on vacation next week. I look forward to catching up on June 20. Wow, the volcano eruption certainly does complicate matters. You can be sure that I’ll be praying for you and the team, for your little “left behind” sweetie, and that this whole experience will be enriching for your family and those you serve. Thank you, Barbara! God is good to provide what we didn’t even realize we needed. Nothing is more powerful than prayer in the moment, even when we don’t know how much we need it. Lord, I lift Kristin and her family to you. As Kristin and Greg teach Cate and Ben how to be the hands and feet of Jesus, fill them with wisdom. Let Cate and Ben see the compassion and care of all those traveling with Bethel Ministries team. Be with Rachel as she stays home. Let there be special moments with grandparents and ease any fear or anxiety in Rachel (and her mom and dad). And, Lord, as the devastation from the volcano spreads, direct the steps of Bethel Ministries. If needed, help them adjust plans. Grant them traveling mercies. May their work shine the love of Jesus on each person they come into contact with. And, in all, may You be glorified. In Jesus’ Name. Amen. I’m discovering the value of praying in the moment. It has such a profound impact on people to stop everything and say a small prayer instead of a promise to pray later on your own! And praying now for your trip, for doors to be open and wisdom for your leaders in light of the volcanic activity. 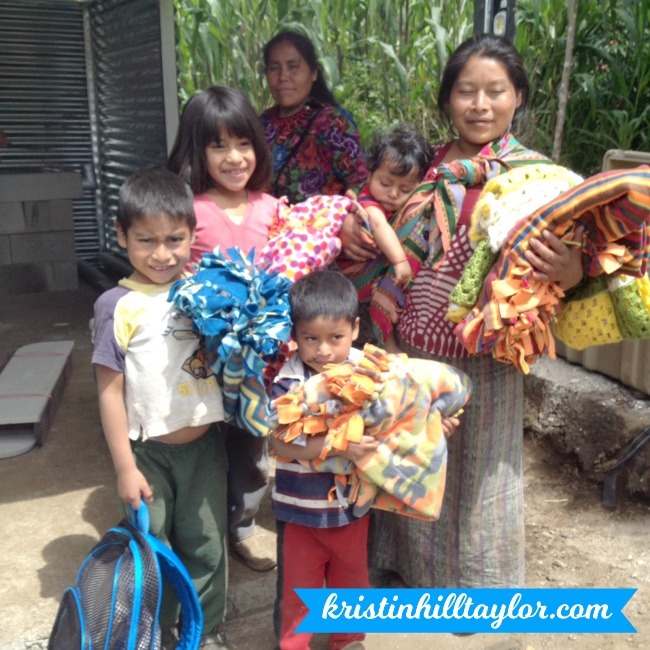 I left part of my heart in Guatemala too. I’m glad you’re getting to return, Kristin. Praying for those affected by the volcano. My friends there are safe, but they did receive some damage. I’m glad your friends are safe, Lisa! Thanks for being here.